These extremely strong filter papers have a high wet strength due to the addition of a small quantity of chemically stable resin. Normal qualitative applications will not introduce any significant impurities into the filtrate. The resins do, however, contain nitrogen so these grades should not be used in Kjeldahl estimations, etc. Some wet strengthened grades are available in folded (prepleated) forms. 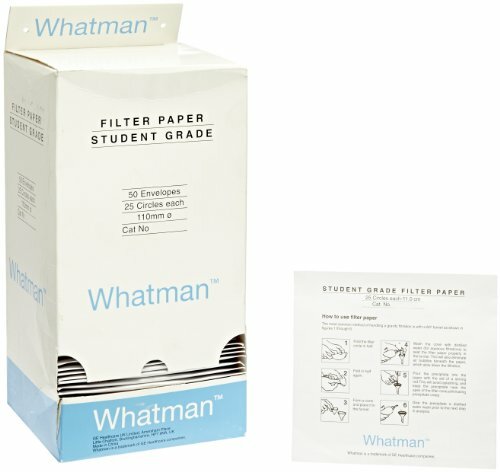 Grade 93: This filter paper is intermediate in speed and retention between Grades 1 and 4. Available in a dispenser pack, which can be attached to the wall or bench, placed on a shelf either upright or flat, and used as a normal carton or as a convenient dispenser. The envelopes are released individually for easy one-at-a-time removal. Package and envelopes are clearly marked for size and content. Properties: medium. Particle retention in liquid ((µm): 10. Particle retention rating at 98 percent efficiency. Filtration speed (approx.) herzberg (s): 80. Basis weight (g/m sq): 67.